Earlier this year TRAD TKO Boxing Gym head honcho Johnny Eames announced that he will be promoting events in 2013, keeping to his word Johnny last night announced that his first UK event, tagged ‘Two Tribes Go To War’,will take place at York Hall, in Bethnal Green, London on Saturday 1st June 2013. 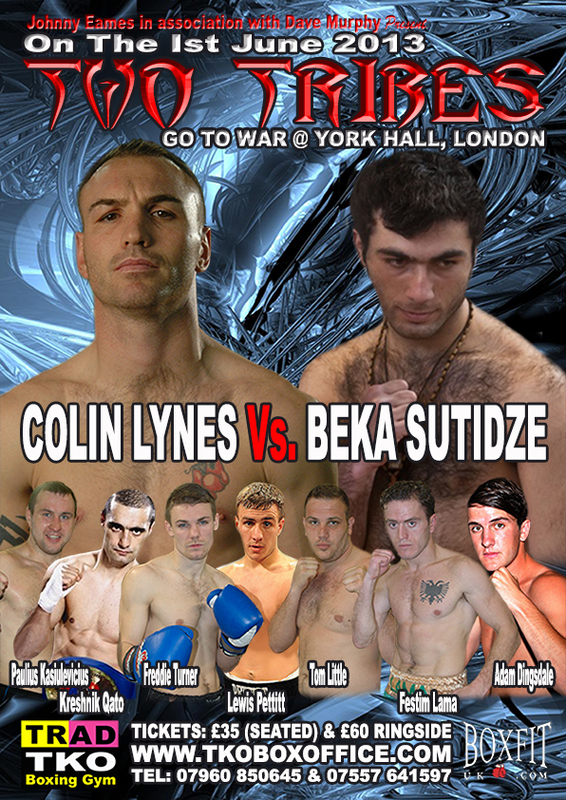 Headlining Johnny’s first show is former IBO Light Welterweight World and British Welterweight Champion Colin Lynes in an International contest against Georgia’s Beka Sutidze. Supporting Lynes-Beka Johnny has put together a solid card featuring many of the rising stars from his TRAD TKO stable, as well as a couple from Alan Smith’s squad. On making the announcement a clearly pleased Johnny said. June the 1st sees the launch of TKO Events, something that should have been launched in April and then May but eventually ended up being in June. As it’s our first show we’re really excited here at the gym, it was supposed to be a co-promotion with Spencer Fearon but Spencer has other commitments and he can’t do it, so no hard feelings there but I promised the boys fights so obviously we’ve had to go ahead with it. I’m really looking forward to it, although I have promoted events with other promoters this will be the first time I’m promoting my own show. It’s been a challenge, but with the help of Rio (Gianluca Di Caro), Dave Murphy and Tony Vincent we’ve slowly got it together. We’ve had promises of sponsors, but they didn’t materialize for whatever reason but now we’ve got another sponsor in place, who put his money where his mouth is and come up with the money straight away, which has helped make the show possible. We’ve got five or six of our own fighters on the show, plus a couple from Alan Smith in Adam Dingsdale and Lewis Pettitt. I’m looking forward to working with Alan again, it’s been a long time since we’ve worked together. Headlining our first show is Colin Lynes, I’ve know Colin since he was a kid so it’s a real pleasure to be promoting him. I believe Colin’s still got a couple of titles left in him and if we get the opportunity we will progress him onto the title trail once again. On the 1st June we have Colin fighting Beka Sutidze in a non-championship International bout. This should be a really great fight, both boys like to go to war, so it is an appropriate headline fight for our first show, which we named ‘Two Tribes Go To War’. Our Freddie Turner gets his second outing since signing with us in March, He’s another one we want to move onto the title trail as soon as possible. I don’t need to say too much about Freddie as I have said it all before, Freddie is one of the most exciting young prospects around and it’s an honour to have him on board. On the 1st June Freddie will have his work cut out, as he’s facing Jay Morris, who as I’m sure you know is as tough as old boots. Another of the TRAD TKO boys on the show is Festim Lama, with Festim it’s a matter of what you see is what you get. He’s a tough kid, who comes to fight. He’s very, very entertaining and will be a crowd pleaser I’m sure. Also on the show I’ve got the debut of my big heavyweight Paulius Kasiulevicius from Lithuania. Paulius is only twenty three years of age but has had plenty of amateur experience. He’s been training with John Murray down at our sister gym, The VK Gym in Bognor, so I know he’s going to be in excellent condition for the fight. Another new signing I have on the show is Tom Little. Tom’s improved so much under the guidance of our Barry Smith, not only in ability wise but also fitness. In Tom’s previous five fights he’s never been totally fit, but now he’s certainly never been fitter and he’s never had as much sparring as he has had since joining us at the TRAD TKO. It’s great to have two young heavyweight involved on our first show. From Spencer’s camp we have Kreshnik Qato, who again I’m sure I don’t need to say too much about. Everyone knows what a warrior Nik is, he’s record says it all. Finally we have a late addition, Eddie (Ediz) Hussein, so late we don’t even have him on the poster. I’m really pleased to have Eddie on the show, he’s another one that you know will always put on a fantastic performance. So as you can see our first event may have been a little late coming but It’s here now and it’s going to be a great show. Colin Lynes versus Beka Sutidze headlines the Johnny Eames promoter ‘Two Tribes Go To War’ event at York Hall in Bethnal Green, London on Saturday 1st June 2013. Tickets, priced £35 (Standard Seated) and £60 (Ringside) are available on line at www.tkoboxoffice.com or in person at the TRAD TKO Boxing Gym in Canning Town or from any of the fighters named.